John Maxmena photo. 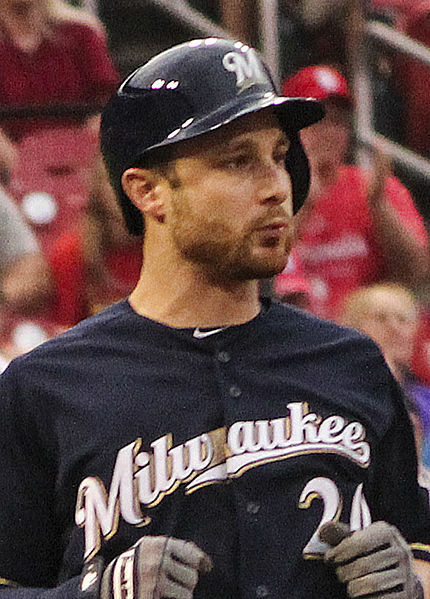 Milwaukee Brewers catcher Jonathan Lucroy set the major league mark for doubles in a season. Congratulations to Los Angeles Dodgers ace Clayton Kershaw, the first pitcher to lead the majors in ERA four straight seasons. Kershaw finished the 2014 campaign with a 1.77 ERA, the lowest in the National League since Greg Maddux’s 1.63 mark for the 1995 Atlanta Braves. Cincinnati Reds ace Johnny Cueto posted the next lowest ERA in the N.L. at 2.25. Felix Hernandez of the Seattle Mariners finished with the American League’s lowest ERA, 2.14 ERA. Congratulations also to Jonathan Lucroy. The Milwaukee Brewers catcher set a single-season record for doubles by a catcher with 46, one more than Ivan Rodriguez hit for the 1996 Texas Rangers. Lucroy actually hit 53 doubles total, but he hit seven while in the line-up as a first baseman. His final two-base hit tied the Brewers’ franchise mark established by Lyle Overbay in 2004.